perspective, he cannot interpret prophecy aright." "Scripture never, in any dispensation, mingles these two principles." but mere opportunities to share the Messiah." that we too may walk in rhythm with Yeshua." has lost. . . . Does any of this surprise the LORD? No." 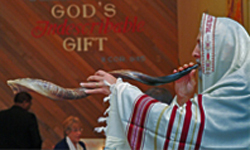 "laying out a full vision for Messianic congregations." The effectual fervent prayer of a righteous man avails much. ~ James 5:16.
to paint the local Catholic church . . . .